Back in 1930's, Indianapolis Blvd. of Indianapolis Boulevard and Ridge road ( Now US 41 and Rt 6 ) to fill up their tanks and check the oil. The Owner of the filling station was William Louis Johnsen an immigrant from Copenhagen Denmark. He operated the station and was a maintenance supervisor at the Gary National Bank. William ran the station with the help of his New wife formerly Julia Waligora, Julia nee ( Cieniawski ) who was a widow with 2 sons Bernard (BEN) age 8 and Edward age 9. Bernard (BEN) and Edward legally had their last names changed after William Johnsen married Julia in 1929. In 1938 Ben and Edward were 17 and 18 and had many responsibilities. Times were tough and William (BILL) was a hard man, the teenagers had to work from sunrise to 9 pm almost every day during the Summer break. Looking to cash in on the tourist trade to Wicker Park. Bill decided to put up food stands to serve the motorists specializing in selling Apple Cider, Peanuts and fruit. In 1938 Bill left for a vacation with his wife Julia and left the boys in charge of the gas station and the farm stands, He asked them "To fix up the stands and keep busy." NOTE: My father would run track at Hammond High School then work at the Gas station afterwards. My father was offered a full scholarship to run track at Notre Dame but his father would not let him go because he needed him to work the gas station with his Mother and his Brother Ed. In 1938 Highland was growing and one business was a Lumber Company owned by Mr.George Fishtorn. He often saw the boys as he came by to fill up his lumber trucks with gasoline. William thought of expanding the stand to a building about half the size of a garage. Ben and Edward thought it a good idea but did not have the money. Mr Fishtorn had an idea "How about We trade lumber, materials and workers for gas for my trucks," Ben and Edward agreed without their father knowing and asked the farm stand to be tripled in size to what their father wanted, in a few weeks the building was built. The deal was made on a handshake. You can imagine the look on their Fathers face when he came back 8 weeks later and saw a finished 800 sq. ft. building. The building cost about $500 in credit. 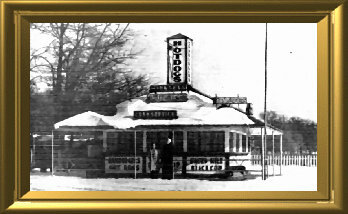 The shingled roof was Blue and so they named it "The Blue Top," - however early pictures of the restaurant depict a spinning blue top on the signage. Ben worked the Gas Station and the Blue Top with his Brother and they attended Hammond High School. The boys left school for a year as their father was severely injured in a car crash. Bernard (BEN) set State records for track that were not broken until 1976. After taking a year off from high school the 2 brothers went back to school and graduated in 1940 and afterword Ben enlisted in the Navy with his brother Ed. Ben becoming the Chief Navy food inspector and a cook on the Island of Guam after letters were presented to the Navy Recruiter from a Mr. Teibal of (Teibals restaurant) and a Restaurant food supplier - Sysco Foods- that Ben was a top chef. When Ben returned after WW II, He Married the Love of his life Wanda (Wendy) Hynek in 1946, they had 3 Children. Edward, Ben's brother married as well and both wives worked together at the Blue Top while the husbands worked part time at the restaurant and full time in the factories. Ben first at Kaplan Bros. Shoes then at Lever brothers finally at Lasalle Steel and Ed at US Gypsum. Ben expected that Indianapolis Boulevard - US 41- was going to get more traffic. He decided to purchase the land 100 feet South of the Blue Top and build his own Drive-In restaurant. The new Blue Top opened November 11, 1964. I remember my Mother telling me that opening day was horrible, the people just kept coming, we could not close and did not go home till 4 AM. Much of the land just South along US 41 was still farm land, to the South was onion fields to the East Cabbage fields, a small wood fruit stand on US 41 was operated by a Mr Jensen. Until the early 80's horse back riders would cut across the fields and eat lunch at the old Blue Top the riders would tie up the Horses to the railings. In the early 60's I remember going to work with my mom and sleeping on top of a silver pop cooler with my favorite blanket. I remember my father making Root Beer, stirring it up with a big wooden oar in a tall 30 gallon crock pot on the floor and that I had to stand on my tip toes to peer in to see the black swirling sticky syrup. My father used so much sugar making Root Beer that the "Law" questioned him about operating a moonshine still in the back room. The colored lights at night attracted about every kind of insect from miles around so I had quite the bug collection. I was about 4 years old but I remember that my Father used to sweep the parking lot of the Blue Top in the morning and pick up the trash. I look back with amusement that he swept the parking lot when it was then just gravel. There was no air conditioning and the building had swing up windows to allow a breeze to flow through which was both good and bad. If a young Hot Rodder spun their tires in the parking lot a fine white powdery dust would drift into the restaurant from the gravel parking lot. Especially from what I was told was a teenager named Charlie Biesen, when he arrived a shout came out to - Close the windows- Here comes Charlie. When the old Blue Top was open, Ice was needed to chill the Root Beer. The Ice was delivered by Mr. Sam Koistra who later opened Highland Radiator and Lawn Mower repair in Highland. From the 50's, to the Late 80's Drive-IN's were the "In Thing" not just Drive-In Restaurants but also Drive-In Movies. I remember going to the Drive-In Movies in Griffith Indiana in 1966 (I was 7 at the time) to see the movie "Bambi" which was quite traumatic - I might say - but - The Blue Top advertised on that Movie screen so Snooky took me with her son Johnny. Snooky (Rosemary Steele) worked for my parents for over 25 years and was like a member of the family. Teens and Families discovered that Drive-In Movies and Drive-In restaurants were a great place to have fun. Before Cell phones and the internet Drive-in's were a great place to meet your friends and maybe find a date. Oh - I remember The Teens at the Blue Top standing in line to use our Public Pay Phone. The New Blue Top Sign was constructed of ceramic coated steel and has 100's of feet of Neon tubing. It is 28 feet high and 16 feet wide. It had over 40 High voltage transformers and 100's of feet of wiring. The type of sign is called a mini spectacular popular at the time in Las Vegas. It was constructed by Calumet Sign Company of Gary Indiana. The BLUE TOP under construction Summer of 1964, Contractor: Rocket Construction. Far right Wendy Johnsen, Julia Johnsen and Ben Johnsen. My Father always wore a starched white shirt and a Bow Tie. As the Blue Top was being built folks around town thought it was going to be a church because of the unusual roof. In 1966 only a few restaurants were in the area, often the Blue Top was open till 3 AM and opened back up at 7 AM. The local police would get cross because traffic was backed up to the next light from people trying to get a parking spot. Ben would "time" the customers and make them order every 30 minutes. Another 75 feet of land was bought to expand the parking. 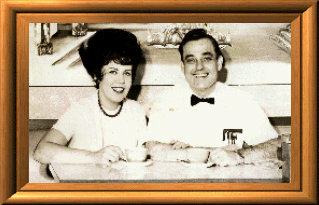 In 1948 Ben and Ed's Father passed away and Julia their mother decided to build a Motel in 1950 around the Blue top which she named the Johnsen's Motel. The Shell gas station was sold with 4 unit apartments ( the Highland Cabins ) to a Mr. John P. Rogers. The present site is just South of the Highway of Flags Memorial at the corner of US 41 and Ridge road. In 1951 Ben and Edward could not afford to pay the lease to their Mother Julia to operate the Blue Top and pay rent for the 2 Motel rooms in which both brothers lived in with their families so they had to leave the restaurant business and work in the factories full time. Julia Johnsen nee (Cienarski) who immigrated to the USA at 16 after her parents were killed in a train crash was from Mzanna Dolna (now in Poland). Julia ended up leasing the Blue Top to a Peter Agarichas. 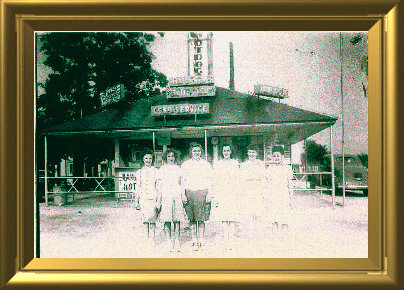 The Blue Top was then renamed Pete's. Julia still owned the property, building and equipment. Ben could not let his dream go and saved his money and bought out the inventory of Pete's in 1953 for $500 and assumed the lease of $1000 a year. Ben then changed the name of the restaurant back to The Blue Top. Ben partly offset the lease to his mother by painting the Motel units and helped to maintain the Motel property, Wendy did Julia's accounting, ran errands and helped with the Motel Laundry. Ben and his family lived in one of the Motel units until 1955. The property for the New Blue Top was purchased from the AWERDA family of Highland. Until the NEW Blue Top Drive-in was built in 1964 the Drive-In was closed during the winter months. 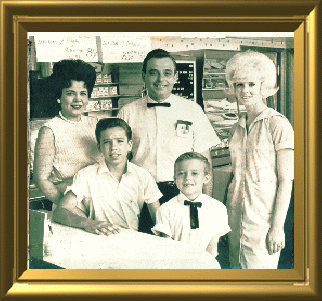 After 1964 our family never again went on vacation together, My Mother and Father thought of little else except the Blue Top but they were so Happy working together EVERYDAY. 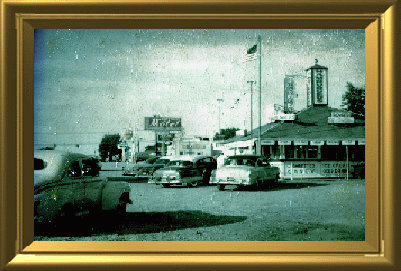 In 1965 the old Blue Top was torn down but the Johnsen's Motel remained. In 1978 Julia Johnsen passed away and the property was sold and the motel was torn down and a medical facility was eventually built ( which is the site of the medical facility right across on Ridgewood street 100 feet North). Since Blue Top was near Wicker Memorial Park some famous people came to eat. The Boxer Joe Louis was one, also the Chicago Bears going to Summer training in Southern Indiana used to visit. Another "Celeb" was Katherine Hepburn on her way to Florida. In the late 60's Drag racers on their way to US 30 Dragstrip would park and grab a bite before the races. I remember when I was small the back row parking lot of the Blue Top filled with trucks pulling trailers carrying all types of dragsters on Sunday mornings and some of the racers would stay at the Johnsen's Motel for the weekend. Starting in the 50's teens started to build "Muscle cars" The past time of "Hot rodding" became popular. The best place to show off their "Rides" was a Drive-In restaurant. They would race at US 30 Dragstrip " Now only a memory." Teens would drive to the "Top" and to another Drive-In North in Hammond Indiana - ARTS drive-IN, They called it "Cruising" hence Blue Top was Called "The Home of the Cruiser" "The Cruiser" is also the name of our most popular 1/3 lb+ Cheeseburger. Until 2014 - The Blue Top remained the same since 1964.
Business in the 90's to the present has been challenging, From 1999 to 2002, US 41 was widened that added 3 lanes of traffic and eliminated 14 parking spots. Ben Johnsen passed away at home with his Wife Wendy at his bed side on December 3, 1993. Ben was 72 yrs of age. He left the restaurant in the care of his wife Wendy and son Kent. I always remember how patriotic he was every day at the New Blue Top we unfurled 2 American flags each attached to a 10 foot wood pole and placed them into holes in the sidewalk and at night the last thing we did before we closed was to roll them up and take them inside-Every Day. When my father heard TAPS being played he would get teary eyed - Every Time - as he explained to me - I get choked up thinking of all those who never came home. I remember my dad would argue with White Sox fans, He being a Cubs fan -- A small Japanese transistor radio with its battery cover long lost held up to his ear to hear the ball game. Wait till next year was commonly heard. After Ben passed we focused on bringing in more traffic by helping sponsor Charity Car Washes, some years over a 100 hundred car washes were done at the Blue Top. Cruise nights with grab bags, trophies and dash plaques for every one who participated. Open Mike Night and bands was another idea. Car/truck/motorcycle clubs were also welcome all they had to do is order and tip the Carhops. Corporate Franchises continued to move into the area with their "cookie cutter" restaurants. Many of those "fast food operations" were like toy stores, piggy backing the newest craze or movie and some did not survive. My Mothers name was WENDY - But - Looking back I wish I named a sandwich after her The W**DY Burger and trade marked it - we'd be rich - oh well. In Late December of 2012 Wendy Johnsen became ill and the Blue Top was closed so that her family could take care of her. Sadly she passed away at home on Febuary 9, 2013 at 86 yrs. of age. The Blue Top Drive-In is now operated by. In the late 70's & 80's a Media blitz was on the way. It looked like "Cruising" was making a come back. Blue Top was featured in many "Car Magazines" WTTW did a special on their "Wild Chicago" Program. WBBM TV did a news special. PBS stations were taking an interest too. Local papers were doing full color stories. An advertising agency from Chicago was renting out the restaurant to film commercials. A small film company rented the property for a short film. However, sadly the regional economy began to slip in part from the loss of industrial jobs. In the late 90's some of the local small businesses were hurt due to choking road projects and the development of the Highland Grove Mall. Nationally, Drive -In's evolved into Restaurants operated by Big Corporate Franchises with Drive-Thru windows. This is a Remake of the original video with added pictures and new royalty free music. The music sounds best on a home computer. This video follows the history description above. This Video runs for 23 minutes and can be enlarged or viewed on YouTube. This video shows 79 years of picture history of the Blue Top Drive-In, Shell gas station, Highland Cabins later the Johnsen's Motel. Their are pictures of Ben, family and Employees way back to 1938 and earlier to about 1934, Pictures and video of Christmas Parties held at the Blue Top from from 1967, 1968, and 1971. Interview with Ben and Wendy Johnsen. First commercial that I created and aired on local cable. Short clips of Cruise Nights held at the Blue Top Drive-In 1998 to 2003, full length versions available on YouTube which can be accessed from the Archive Video and Slide show link on this page. Last film clips are from 2012. If you are having difficulty viewing this History page or the full quality videos use google chrome or reduce the magnification on your browser.